Western songs reflect the traditions and history of a large part of our country; the genre keeps those stories alive – stories about a type of work that used to be more prevalent and visible than it is now. Grombacher carries on the western tradition by writing songs based on his experiences with ranchers and cowboys, as well as his own work fighting forest fires in Oregon and digging as an archaeologist in New Mexico. Cowboy poetry and music gatherings have allowed him to interact with other classic and contemporary western musicians and poets. Ian Tyson, a Canadian western songwriter, Tom Russell, a contemporary folk and western singer, and Colorado songwriter Chuck Pyle have helped inspire his music, which blends real and imagined perspectives of both the historic and current West. “When I perform, I try to create a feeling of intimacy that invites listeners into the stories I weave and the songs I sing,” Grombacher said. Bob Sweet, an organizer of the Oct. 2s concert, met Grombacher at a cowboy poetry and music gathering in Sierra Vista, Ariz.
Grombacher started playing guitar and writing songs as a teenager. At age 15, he began performing the country songs he grew up with, like Bob Dylan, Woody Guthrie and Phil Ochs, in coffeehouses. After studying Western American history and cultural studies at the University of Texas beginning in 1970 and performing until the mid-1970s, he settled down to raise a family. 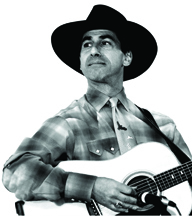 In the early 1990s, he picked up his guitar again after he met a cowboy poet, a friend of his parents, in Arizona. “That opened my ears to storytelling songs of a different sort than I was writing,” Grombacher said. Since then, he’s been traveling throughout the West, sharing his music.